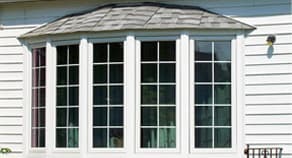 What options are available for home replacement windows? The difference between vinyl and aluminum windows. When you start looking into options for new and replacement windows, you might feel as if you’ve just fallen through the looking glass. In today’s shrinking world full of expanding solutions, it often seems as if it’s easier to stay in bed and pull up the covers than figure out thorny problems like which is the best kind of window for you. A generally more attractive, less utilitarian overall appearance. Lots of different finishes are offered in vinyl window frames, and if scratched or chipped for any reason, the exposed parts will look the same, since the material is the same throughout. Vinyl frames are thicker than their aluminum counterparts, which may not be as appealing, depending on the building’s style. If a painted aluminum frame is chipped or scratched, the metal will show through. An aluminum window’s frame is thinner, providing a more modern aesthetic that’s good for larger, commercial buildings. Larger-sized windows are available as well. Highly resistant to scratching, cracking and marring. Not as easily dented. Resistant to scratching, cracking and marring, except for the surface, if painted or powder-coated. More prone to dents. Vinyl cannot be painted, so an exact color match may be difficult to achieve. Aluminum window frames can be painted or sometimes powder-coated. This can provide an exact match to the color desired. However, if the paint or outer coating chips off for any reason, the metal underneath will be visible. The wood-grain appearance on vinyl windows is a popular alternative to actual wood, which is more problematic than either vinyl or aluminum. It’s also superior to the painted surface of aluminum windows. To get the look of wood on an aluminum window requires the use of a coating treatment. This is inferior to the vinyl wood grain effect, which is the same material throughout, as opposed to an external coating. Not a problem with vinyl windows. Over time, the steel or zinc fasteners used for aluminum windows may react with the aluminum and corrode. Not a problem with vinyl. Aluminum windows can pit, and the painted surface can fade. Vinyl windows weigh more than aluminum windows. Lighter weight, which makes aluminum a good choice for large facilities. 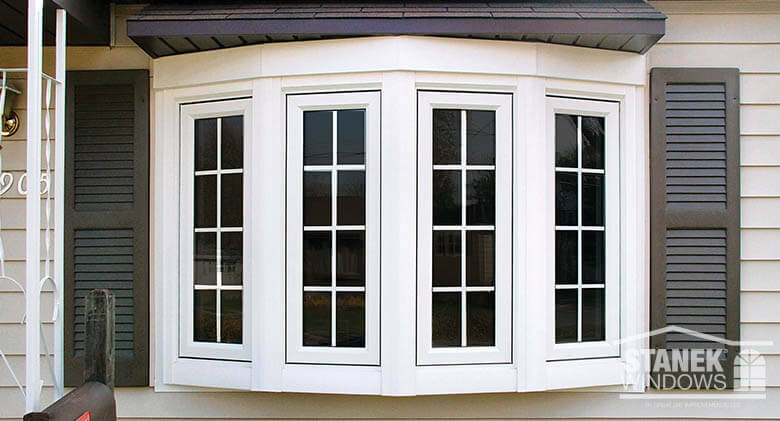 Vinyl windows perform better when it comes to this important contemporary issue. They are designed to provide the industry’s best energy efficiency. Aluminum windows are notorious for acting like radiators, bringing unwanted heat from the outside into the room. They also conduct cold in the same way as heat, so must be specially protected with “thermal breaks,” to compete with vinyl windows for energy efficiency. This adds to their cost. 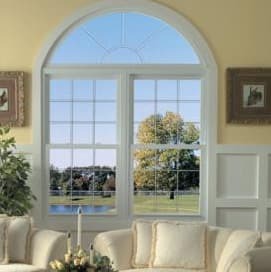 Vinyl windows create less condensation than wood or aluminum windows. The heat transfer action that is characteristic of aluminum (for which reason it’s used in cookware) creates condensation and related problems. This is especially true in the north part of the nation. When condensation seeps between the window and the wall, it causes rot, mildew and mold. Vinyl is itself the best thermal break. It minimizes heat transfer from the outside of the room to the inside. Thermal breaks are employed in many modern aluminum windows to combat the problem of condensation and increase the windows’ energy efficiency. These are made of vinyl. Lower maintenance requirements than both wood and aluminum. No need to repaint or restain ever, since they are the same color throughout. Aluminum windows must be lubricated regularly, since their moving parts consist of metal against metal. If painted, they will require regular maintenance. Typically less expensive with better value. Typically more expensive if you get anything but a bottom-line product, which is highly energy-inefficient. 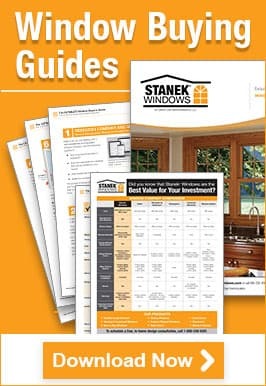 Stanek vinyl windows by Great Day Improvements, LLC are custom-made, top-of-the-line, contemporary window products. An expert representative will be happy to come to your place in person and help you sort through all the confusing alternatives. We’ll make a detailed estimate if you like, and it’s all free of any charge or obligation on your part. Register for your free in-home consultation online here.